Dogs are incredible companions to people and this was shown to be true for many thousands of years. Today, just like in the past, many hundreds of millions all over the world enjoy spending time with their pets and many of these are dogs. But, at the same time, there is the lingering issue of allowing ordinary people to attain great dog training tools. Before, it appeared that only seasoned experts have the needed knowledge and ability to really train a dog. However, thanks to the rise of mobile devices and apps, anyone can attain the same results using a DogTrainingApp. This application is designed to allow regular individuals to train their dog in the most optimal manner. With it, anyone can have the all-around tool that will allow them to attain the ideal dog for any individuals, couple or family. 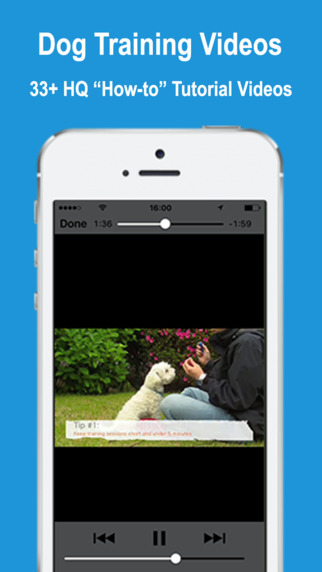 With the use of a simple iPhone, the same dog training app will be able to transform even the most unruly dog into a lovable pooch that never misbehaves. The main strength of this app is the idea that it provides a huge level of user accessibility in the form of videos which can be accessed anywhere and at any time. With more than 33 videos, all captured in high-quality, dog owners will have all the problematic areas completely covered by the app’s data. The videos were made to be completely understandable for everyone, regardless of their level of dog training knowledge. This means that they will be able to train their dog to respond to commands like come, stay, lay down and much more. The training does not involve any cruelty or other actions that the dogs might find unpleasant. Instead of working against the animal’s nature, this dog training app works with them, allowing for a very harmonious way of developing the dog’s skills. The same skills cover both interactions with humans and other animals and pets. Additionally, the app is equally successful in mending problematic behaviors that have already established themselves in some dogs. These might include peeing and pooping in inadequate places, being overexcited when guests or strangers arrive, intensive barking and other things as well. Because of the great system of the app, even these dogs can be set on the correct path and their issues resolved in a manner that is simply perfect. Thanks to all of these advantages, there is little doubt that DogTrainingApp represents one of the finest tools that aid dog owners in training their pets. With this app, anyone will be able to have the ultimate knowledge base for any training procedures that they wish to apply on their own pet and make it a perfectly trained dog. Next Post Latest iPhone 7 Ad – Romeo and Juliet!